Welcome back for more from Africa. This post covers the second half of my epic 2-week, 5,000 kilometer (3,000 mile) road trip around the enigmatic desert nation of Namibia. Check out the first half of the action in Part 1. This photo is a repeat, but I refuse to apologize. It deserves it. My last post ended with the three of us – Jen (USA), Russell (Australia) and myself – cavorting on the largest sand dunes in the world. We followed up our morning on the monumental dunes of the Namib-Naukluft desert with a long drive to the coastal enclave of Swakopmund. Swakop (as it’s known locally) is an historically German town that is the premier destination for vacationing Namibians. The quaint old town has a noticeable charm and offers easy access to miles of beaches and a host of adventure activities. We reached town late in the day and settled in at the Skeleton Beach Backpackers. We spent a quick night at the hostel, hitting our tents early to get ready for another long haul the next day. In doing so, we made a concession to our limited time and the vastness of Namibia. Most visitors to the central coast of Namibia continue north from Henties Bay to Cape Cross, drawn by numerous coastal ship wrecks, an immense colony of seals, and monuments to Portuguese explorers. Our path to Kaokaland took us through miles and miles of uninhabited desert broken sporadically by the small towns of Uis and Palmwag. Late in the day, we reached Sesfontein, a small town set in a fantastic mountain setting that begins transition back into into desert. The drive was a rough and tumble affair over almost non-existent roads through vast stretches of mountainous desert. The area is sparsely populated, home primarily to the Himba people, a tribe whose women are known for the unique look that comes from coating their hair and skin with red ochre. The major population centers – Purros, Orupembe, Opuwo – were comprised of a few scattered buildings. Beyond the few Himba villages scattered thoughout the region, the area sports an array of unique animal species, including desert lions, elephants and giraffes. 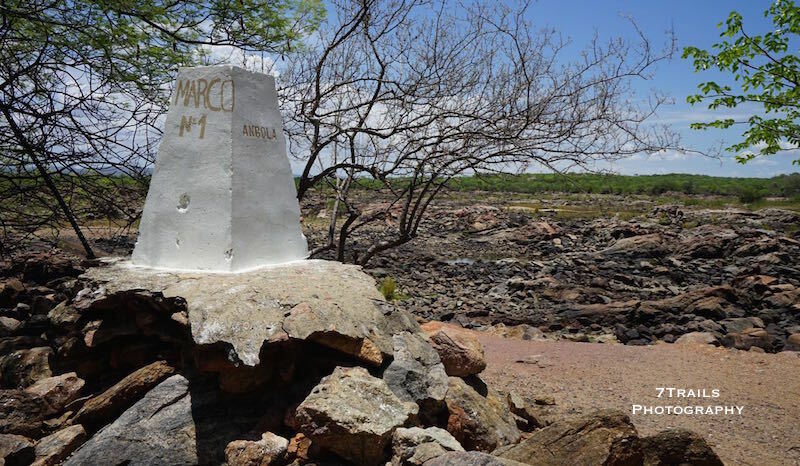 From Kaokaland, we headed even further north toward Epupa Falls and the Angolan border. 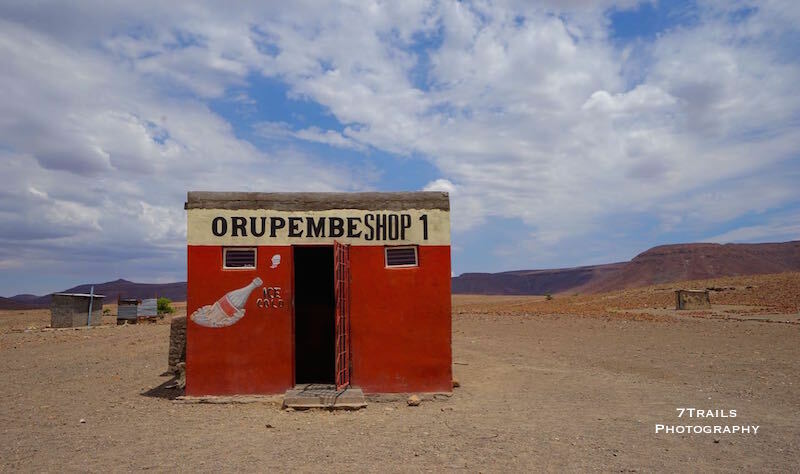 After spending hours driving through the desert, the approach to Epupa makes an incredible impression. Just before reaching the falls the road crests a large hill and presents you with a grand view of falls and the thicket of palm and baobab trees that line the Kunene River in both directions. It’s an oasis of green and blue in a sea of sand. It only got better from there. The Falls remained impressive as we went closer despite the dry season and the area’s long drought. We spent the afternoon investigating the Falls and then spent an amazing night camping along the riverside, with the stars reflecting off the water as it worked its way by. The next morning brought our most serious driving challenge yet. 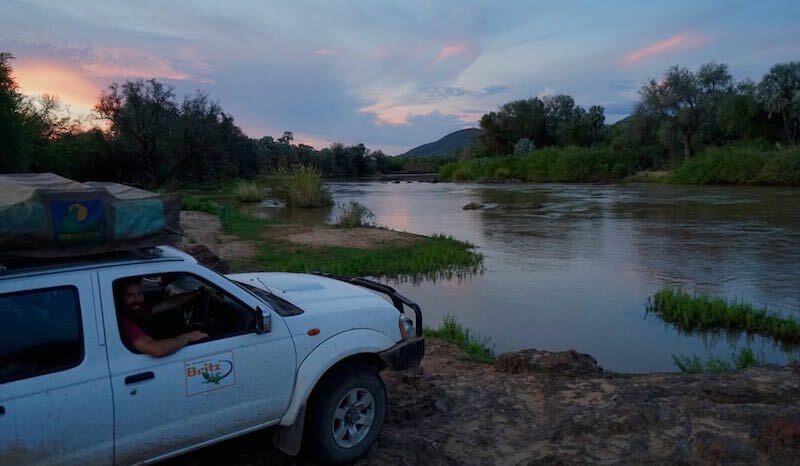 The barest hint of a road winds along the rugged banks of the Kunene River to connect Epupa Falls with Hippo Pool and the nearby Ruacana Falls. Russell and I took turns tackling the steep sections of jumbled rock, dropping down to the lowest gear to grind our way up and down the steep slopes. We reached the end of the drive after an exhilirating and nerve wracking four hours to find our destination sadly anticlimactic. Hippo Pool, long known for the bloat of hippos (that’s what you call a group of hippos. The internet said so.) that called it’s waters home, was now devoid of life. 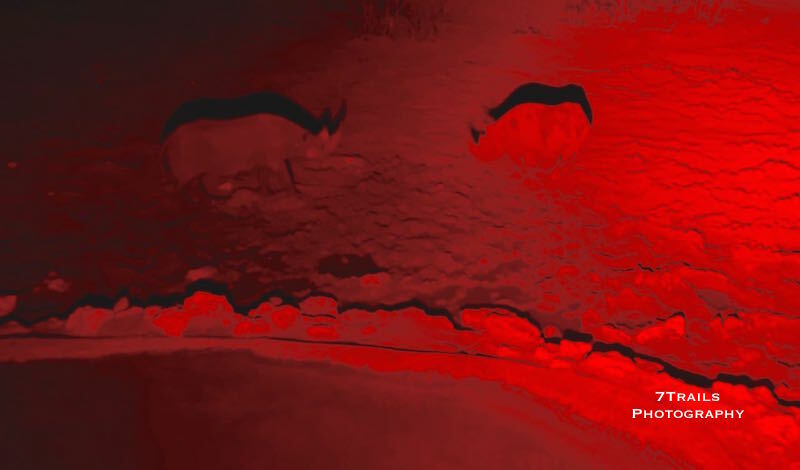 We were told that poachers from across the river in Angola had just recently killed the last of the hippos. 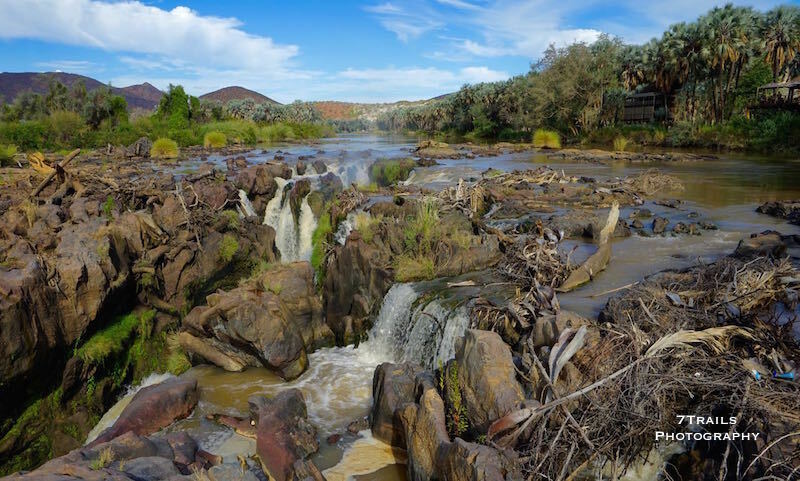 Continuing the trend of disappointment, Ruacana Falls, sitting on the border with Angola, was desperately low and the cataract was a ghost of its wet season form. Our next stop was Etosha National Park. Where Ruacana Falls was a disappointing low, Etosha was a near constant high. Etosha is the 2nd largest game reserve in Namibia and one of the largest protected areas in the world. 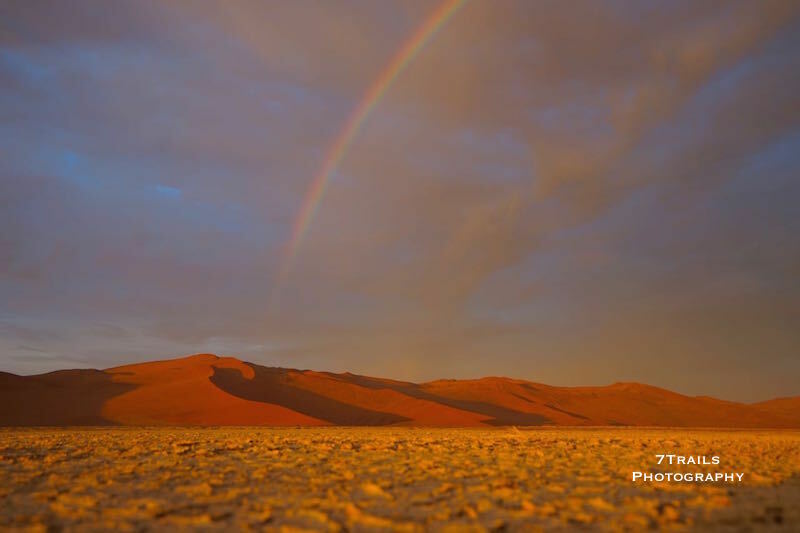 The 20,000 km² national park is centered on a massive salt pan and fosters an overwhelming amount of biodiversity, housing over 110 species of mammals and more than 300 species of birds. 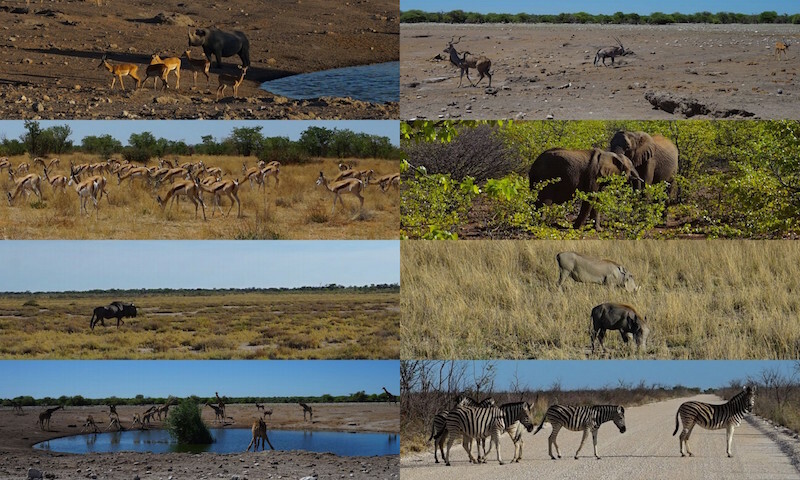 Wildlife in Etosha National Park (clockwise from upper left: Black-faced Impala, Black Rhino, Kudu, Oryx/Gemsbok, Black-faced Impala, African Elephant, Warthog, Zebra, Giraffe, Blue Wildebeest, Springbok). 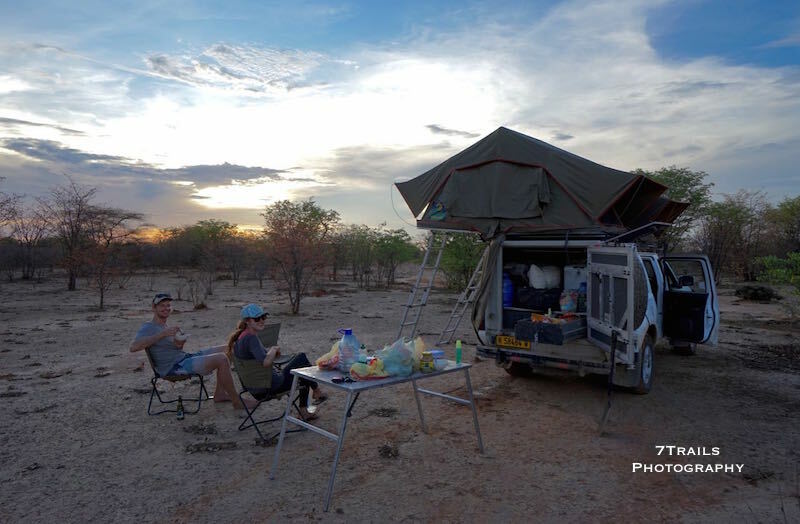 The Park offers visitors a quartet of rest camps run by Namibia Wildlife Resorts, a company owned by the Namibian Government. The primary rest camps – Okaukuejo, Halali and Namutoni – allow guests that opportunity to camp in close proximity to the park’s abundant wildlife. 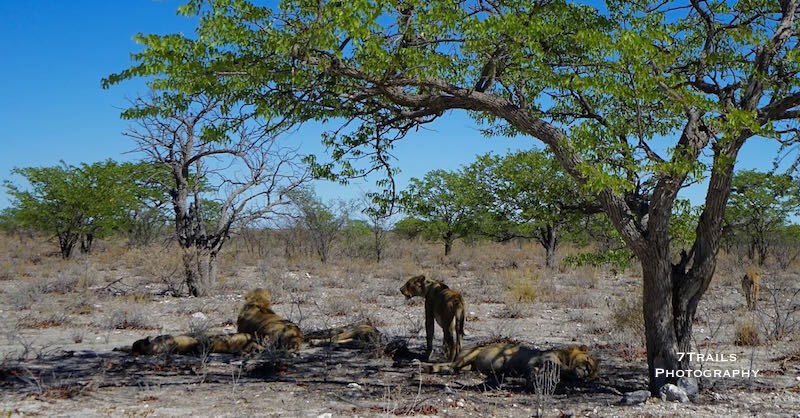 Our dry season timing paid off as the park’s animals were congregating close the water holes that remained wet throughout the arid summer months. 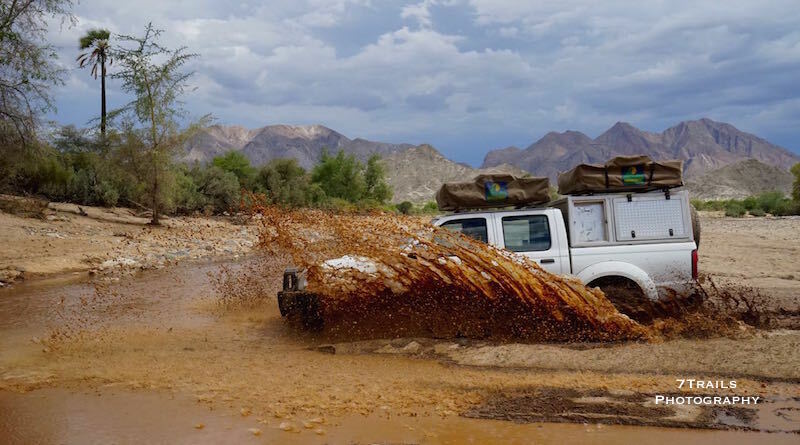 As a result, our long hours spent staking out the water holes and driving the park’s remote roads paid off with sightings of hundreds of animals. During our whirlwind three-day safari around the park, we came face to face with African Elephants, Bat-Eared Foxes, Black-Faced Impala, Blue Wildebeest, Dik-diks, Elands, Giraffes, Hyenas (Brown, and Spotted), Jackals (Black-Backed, and Side-striped), Kudu, Lion, Springbok, Steenbok, Striped Mongoose, Red Hartebeest, Bushnell’s Zebras, Warthogs, Rhinos (Black, and White) and several others that I’m forgetting. Once we finished in Etosha, it was just a matter of getting back to Windhoek in time to turn in the truck on schedule. We took a brief break on the drive back to stop at the Hoba Meteorite, the largest single piece of meteorite and most massive piece of iron on the planet. We then pressed on to wrap up our version of the classic Namibian road trip back where we started. 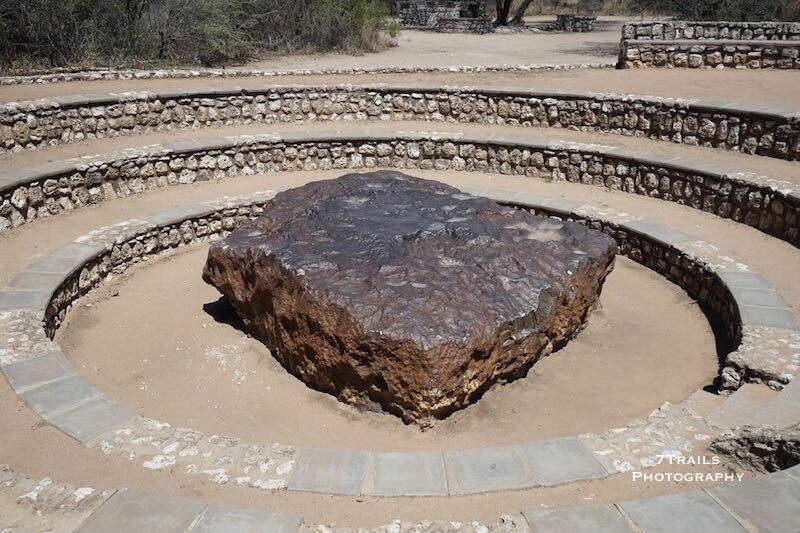 Hoba Meteorite, simultaneously the world’s largest single piece of meteorite and most massive piece of iron. 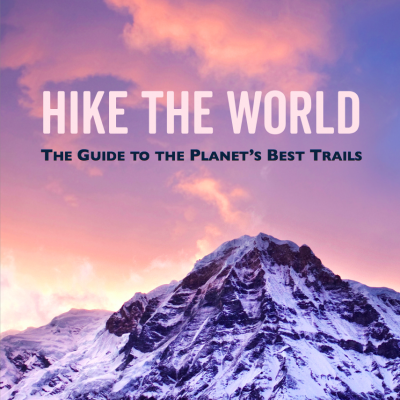 You saw the big 5 … and more!! !